Bring the movie theater experience to your home or business with this commercial grade popper manufactured by Benchmark USA Inspired by the art deco architecture of the late 1920's and 1930's. This pedestal base provides storage for all of your popcorn supplies while placing the popper at the ideal operating height. This cart has 4 wheels to maneuver easily. 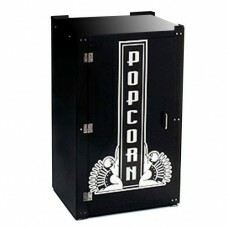 To be used with our 4 or 6 oz metropolitan style popcorn machines. We are the only AUTHORIZED CANADIAN DEALER located in CANADA in CANADIAN DOLLARS, DUTY FREE, NO CUSTOM FEES or BIG SHIPPING FEES.